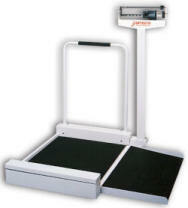 The model 495 and 4951 stationary mechanical beam scales provide the economical answer to the weighing of patients in wheelchairs. Its quality is inherited from Detecto's eye-level physician scale and incorporates a precision die cast weigh beam which is easily read from either side. The weigh beam is located at a height above the platform where the patient or attendant can perform the weighing operation. The ramp is removable and is covered with a non-skid mat. The die-cast, dual-sided beam is graduated in 1/4 lb (0.1 kg) increments for easy readability.